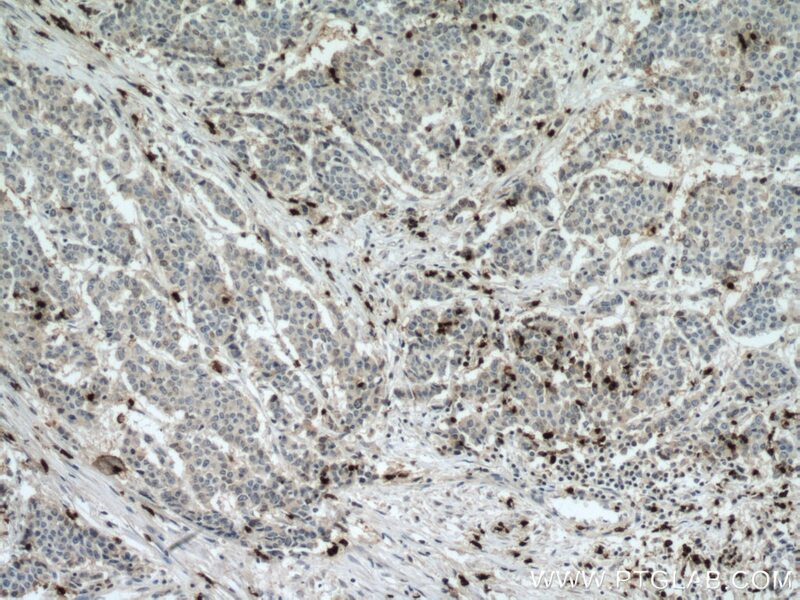 Immunohistochemical analysis of paraffin-embedded human colon cancer tissue slide using 22225-1-AP (MPO antibody) at dilution of 1:200 (under 10x lens) heat mediated antigen retrieved with Tris-EDTA buffer(pH9). 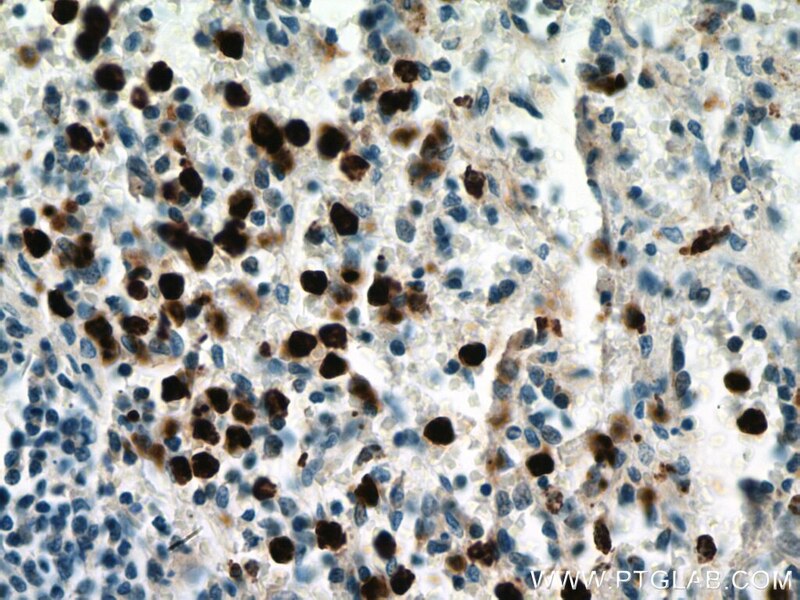 Immunohistochemical analysis of paraffin-embedded human colon cancer tissue slide using 22225-1-AP (MPO antibody) at dilution of 1:200 (under 40x lens) heat mediated antigen retrieved with Tris-EDTA buffer(pH9). 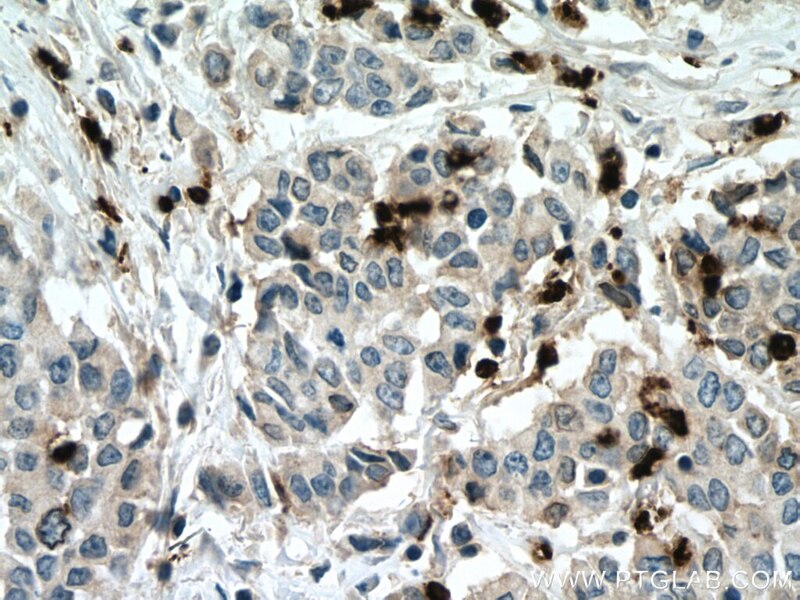 IP Result of anti-MPO (IP:22225-1-AP, 4ug; Detection:22225-1-AP 1:600) with HeLa cells lysate 1600ug. The MPO gene encodes myeloperoxidase, a lysosomal hemoprotein located in the azurophilic granules of polymorphonuclear (PMN) leukocytes and monocytes. In response to stimulation, MPO is activated into a transient intermediate with potent antimicrobial oxidizing abilities(PMID:17650507). The mRNA is translated into a single protein of 90 kDa, which displays enzymatic activity and undergoes proteolytic maturation into a heavy chain of 59 kDa and a light chain of 13.5 kDa; these subunits then dimerize into the mature tetramer and the mature MPO is a heterotetramer composed of two identical heavy chains and two identical light chains(PMID:12773517). The 24-kDa material had a map identical to that of 13.5 kDa subunit and represents a dimer of the 13.5 kDa subunit (PMID:3008892). Defects in MPO are the cause of myeloperoxidase deficiency (MPOD). It has 3 isoforms produced by alternative splicing. 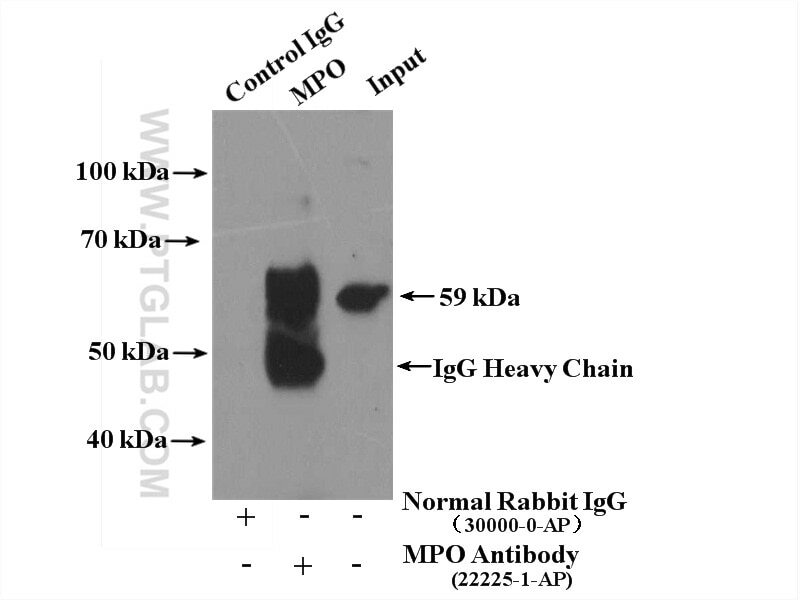 This antibody is specific to MPO. Persisting and Increasing Neutrophil Infiltration Associates with Gastric Carcinogenesis and E-cadherin Downregulation. Regulation of Postoperative Ileus by Lentivirus-Mediated HuR RNA Interference via the p38/MK2 Signaling Pathway. Yin-Chen-Hao Tang Attenuates Severe Acute Pancreatitis in Rat: An Experimental Verification of In silico Network Target Prediction. Chronic low-dose cadmium exposure impairs cutaneous wound healing with defective early inflammatory responses after skin injury. 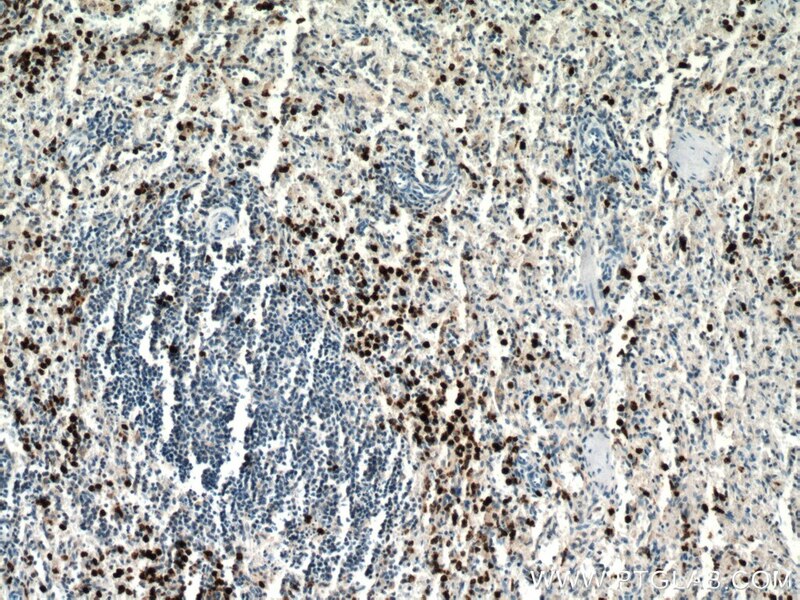 α7-nAChR Activation Has an Opposite Effect on Healing of Covered and Uncovered Wounds. Curcumin plays neuroprotective roles against traumatic brain injury partly via Nrf2 signaling. 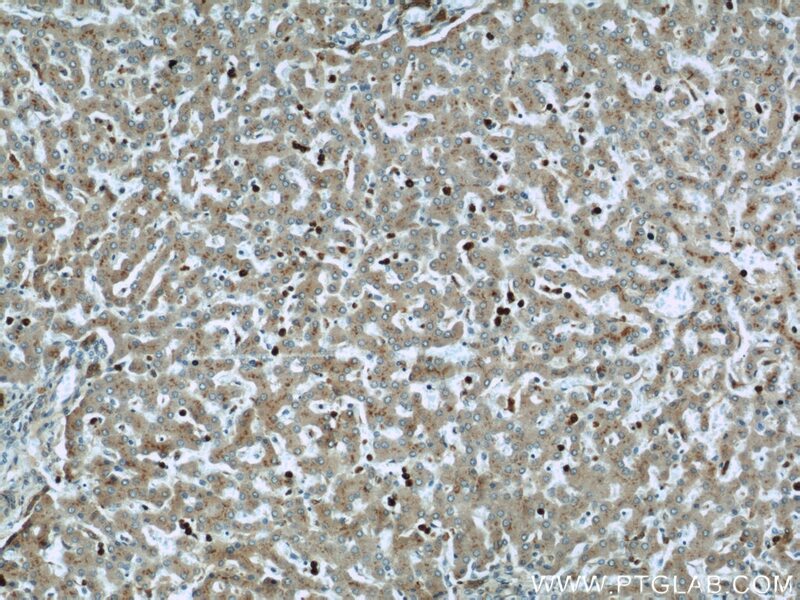 Immunohistochemical analysis of paraffin-embedded human spleen tissue slide using 22225-1-AP (MPO antibody) at dilution of 1:800 (under 10x lens) heat mediated antigen retrieved with Tris-EDTA buffer(pH9). 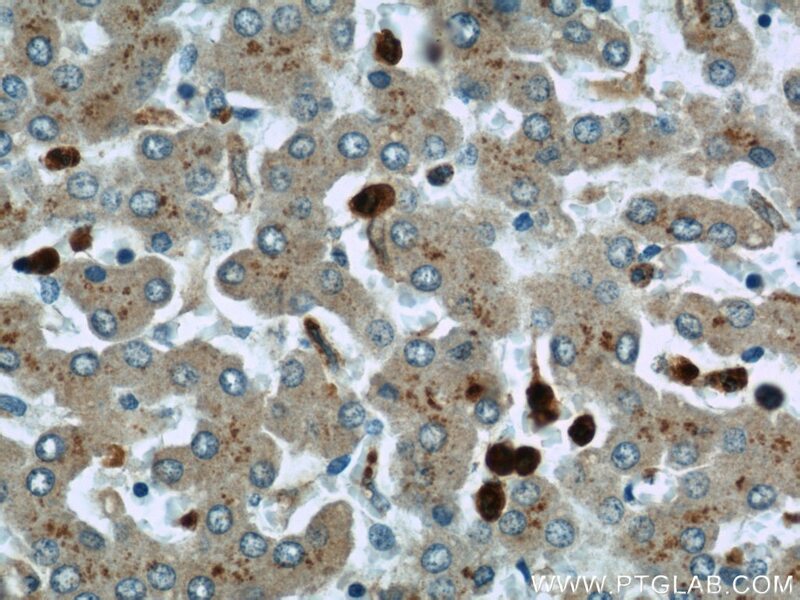 Immunohistochemical analysis of paraffin-embedded human spleen tissue slide using 22225-1-AP (MPO antibody) at dilution of 1:800 (under 40x lens) heat mediated antigen retrieved with Tris-EDTA buffer(pH9).